Here is a patriotic lapghan blanket I just finished up for the Warmth for Warriors. 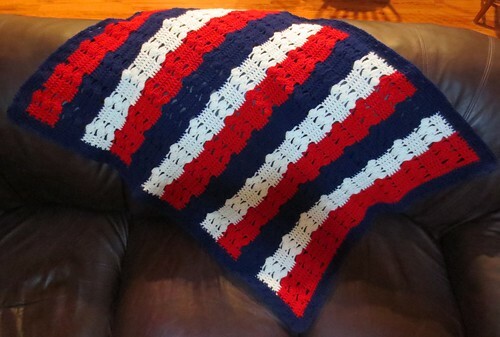 Each year we have a blanket drive where people crochet, knit or sew blankets and lapghans for the troops and veterans. This is my patriotic blanket in honor of the 4th of July. I took the original light & lacy baby blanket pattern and changed colors every 5 rows. I started with Red Heart yarn in red, then white and finally with blue. I crocheted 4 sets of 5 rows in each color ending with one last set of 5 rows in red yarn to finish off the blanket before adding the border. I then used the blue yarn to work the border.